Minin and Pozharsky monument and Saint Basil’s Cathedral in Moscow. Hi Rod, tell us a bit about yourself. I’m a professional photographer and writer who shoots traditional film, digital, cinemagraphs, video and 360 degree interactive VR imagery. I’m basically an image maker in many different formats, styles, subjects, and genres. My commercial shoots pay my bills and my personal shoots satisfy my artistic endeavors. 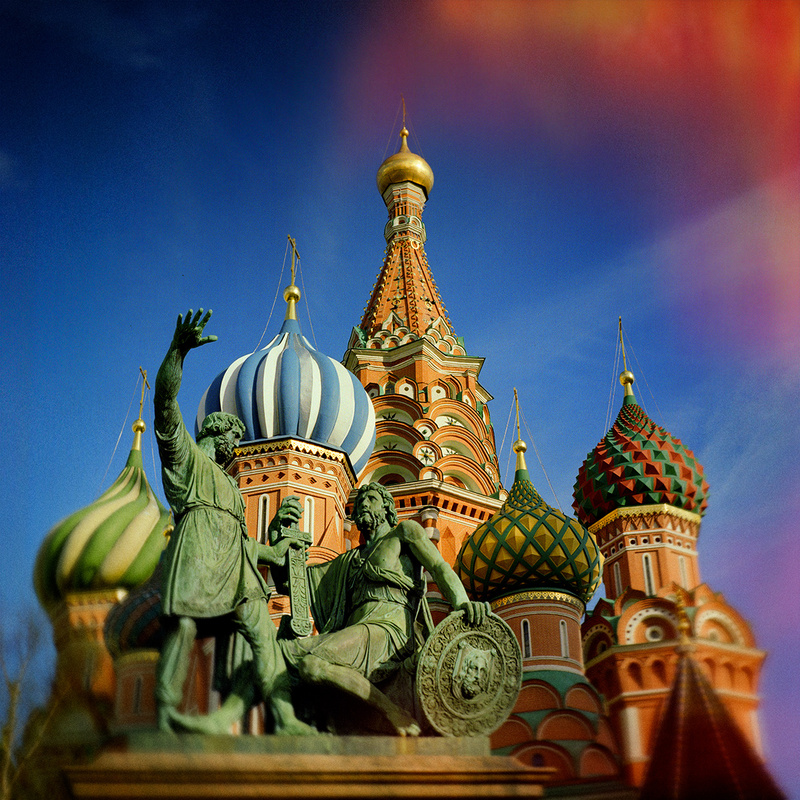 You chose to take a Lubitel to Moscow, tell us about this project? Well, my fascination with Moscow began a few years ago, when I fell in love with a Russian girl. She opened my eyes to Russia’s incredible history, art, literature, architecture and of course its people. I’d always loved the simplicity and design of the classic Soviet Lubitels, and on my recent trip to Moscow I wanted to make more than just photos and memories. I wanted to try and capture that elusive “Russian Soul” (Русская душа) that so many famous Russian authors had written about and that is such a fundamental part of the Russian people’s psyche. I, therefore, decided to shoot with a camera whose very roots had grown from the heart of Mother Russia, the Lomography Lubitel 166 +. This fully manual analogue camera and traditional film seemed to be the best way to breath life into my images, in a way that modern digital cameras simply cannot accomplish. For me, pixel-perfect digital imagery can be so predictable and sterile, but analogue still retains a certain dark magic, a mystique and a charm that just cannot be electronically emulated with Photoshop. This ethereal beauty adds to the allure of analogue imagery and with this in mind, the Lubitel seemed to be the perfect tool for my trip. How was your experience shooting with this camera? In some ways, I feel that digital has stolen the soul from the image making process, so it’s always good to get back to the very rudiments of traditional analogue photography. Automated digital cameras are wonderful for commercial image making, but for more personal and creative work, I prefer to shoot on film. The Lomography Lubitel 166+ Universal still retains the look and feel of the old classic Lubitels, but it’s different in one very important way … it actually works! I’ve owned about five or six vintage Lubitels, and they are so unreliable that they just aren’t always practical to take away on a proper shoot. Shooting manually on my Lubitel gave me a chance to think about each image, rather than just firing off a few digital shots and expecting one to be acceptable. I love the new and vastly improved ground glass screen with the fresnel viewfinder and split-image micro-prism on the Lomography Lubitel 166+. Focusing and composition on the original Lubitels was a nightmare and something of a hit and miss affair, not so with the latest Lomography Lubitel camera, and I embraced these improvements with open arms. Interestingly enough, whilst shooting in Moscow, I found that my Lubitel generated a great deal of interest from the Russian people. They recognized it as something of an icon from their communist past, and it ignited friendly, nostalgic feelings, breaking down barriers that language alone could only hope to communicate. Any tips for other users. Using the Lubitel can be a bit of a challenge as you are in full manual control, and therefore completely in charge of any mistakes – but that’s part of the fun and appeal of Lomography. I bought some very cheap 40.5mm screw-in neutral density filters from eBay. These allowed me to extend the workable range of shutter speeds and apertures for creative effect and when stacked, they sometimes generated unexpected and attractive flare too. The Lubi’s twin lens system also allows you to view and focus the image through the top lens even when the dark ND filters are attached to the taking lens. I also found the film rewind crank particularly useful when I wanted to swap film mid-roll – as you can’t alter ISO once the film is loaded. Finally, I love the way the Lubi’ has retained the characteristics of the original vintage Russian camera … the mechanical shutter simply needs cocking so no batteries required, and it’s also so easy to generate red tinted light leaks by shining direct sunlight briefly through the rear film frame window. Where would you like to take this camera next? I’d love to visit St Petersburg and also explore more of Russia, photographing her people and traditional Russian life. The country has such great disparity between the modern, bustling city of Moscow and the quiet, bucolic backroads of rural Russia. However, the Lubi’ feels at home wherever you take it, it’s just a great camera to use and the results hopefully speak for themselves.